Staying in a dorm during your University days are great, but it also means more responsibility- one of which is doing your laundry. But getting your laundry done proves to be a problem whenever you go to the laundry room, and all the machines are taken. Cue yourself having to go back and forth before finding a free machine. Well, fret not anymore – a few NUS computing students have made use of their education and created a laundry bot on messaging app Telegram! The bot was introduced on the Facebook page of NUS Whispers with a picture posted by an anonymous user. So what does the bot do, you ask? 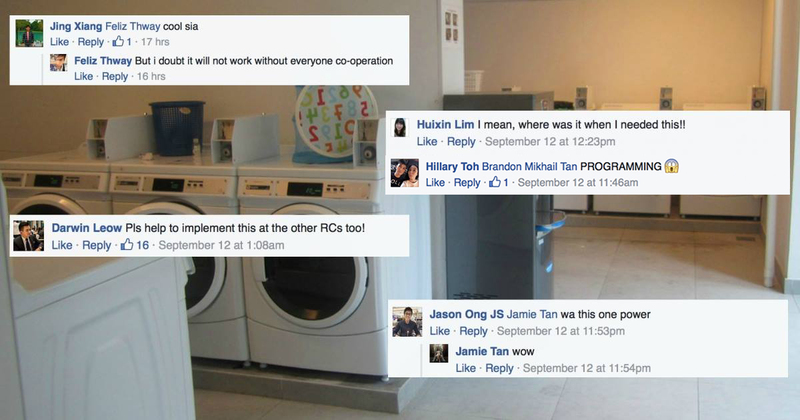 The bot is an user-dependent tracker that tracks the laundry machines in NUS’ Utown Colleges. It allows users to check the status of the machines’ availability, and they get notifications whenever there’s a free machine. Students are able to load their clothing into the machine, take a photo of the “Use” QR code and send it to the bot. It will then let them know once their laundry is done. 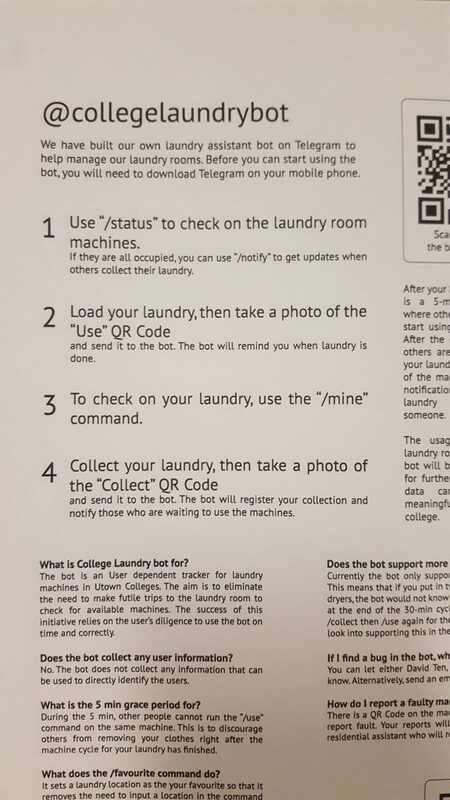 Users who collect their laundry can also take a picture of the “Collect” QR code and send it the bot. It will register that the machine is free, and inform others waiting in line. However, users need to have Telegram to be able to send the QR code to the bot, so for those who don’t have it, maybe it’s time you download it. Being that the NUS Whispers page is meant to be anonymous, there wasn’t any information of who the creators were, and their motivations. 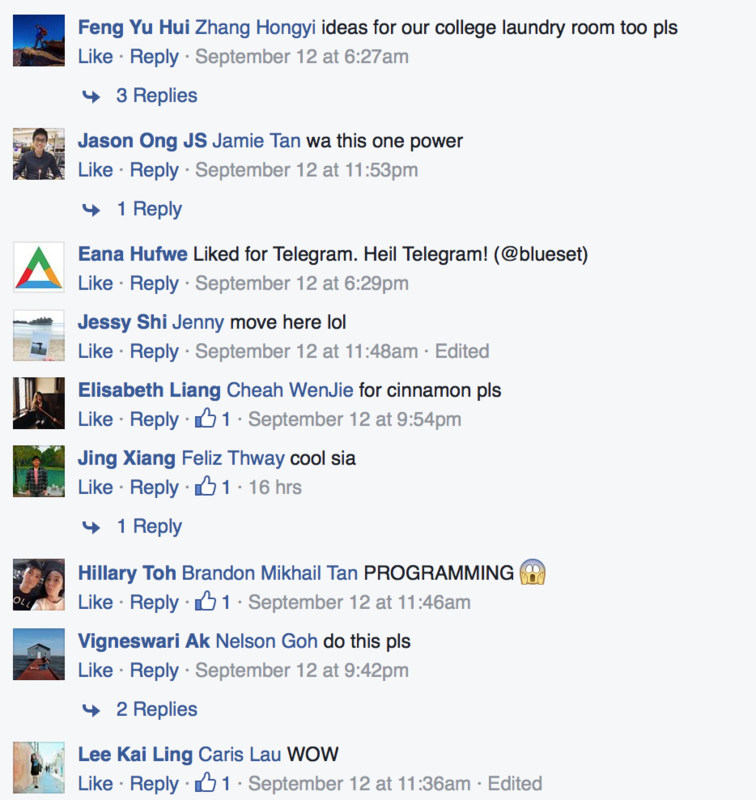 That was until NUS Associate Professor Ben Leong became one of the coolest Profs around, and posted on the thread. Soon enough, user Sam Mauris Yong replied, claiming that it was himself, along with his group of three friends who were responsible for the idea. Albeit some of the NUS students are commending this group on a job well done for making their lives much easier, others are doing the opposite. Some are commenting that this app requires user input – in other words, they feel that it requires effort to use the app with taking pictures of the QR code, and many might therefore not be so cooperative. Many university students are starting their own startups just as they graduate or even before. This group created a bot to solve a pressing issue at their dorms, and from the way things are going, they are definitely going somewhere. Who knows, the next thing they create might be not only be a hit among NUS students, but among the rest of us as well!